It is believed that Humans share a common ancestor with the Great Apes that existed 12-15 million years ago. Orangutans are greatly camouflaged in rainforests because of the little sunlight that filters through the dense canopy reflects green light and absorbs the red-orange light that is similar to the color of the Orangutan's coat (5). It has been proposed that the sexual dimorphism seen between male and female Orangutans is the result of the larger male's ability to overtake the smaller sub-adult males in the mating process (2). 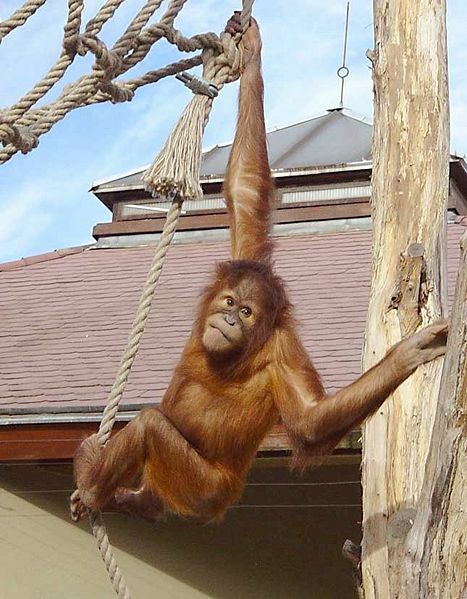 Orangutans are mostly solitary, which is rare since primates usually have rich social lives. 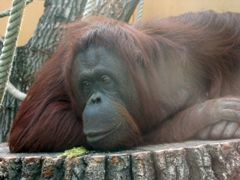 Some theories suggest that being solitary is a necessity for Orangutans since their caloric needs are so large they cannot share. Also, no large predators except for humans threaten Orangutans so they do not need large social groups to protect themselves (5).